Opening rear and side doors, as well as the hood. Dummy engine under the hood. The site lists this set with a price of 49,99€ and says it is in stock. I've some doubts about this, but if it is true, it shouldn't take long until we get the first review online, and also get to know a bit more about this set's details. If the "Limited Edition" yellow band on the box right margin really means some restricted availability, at least we already know where to buy this. Biggest fans disappointment, seems to go for the fact that corner parts defining the windshield contour, "Axle and Pin Connector Toggle Joint Smooth" were not released in black again, but LBG ones were used instead. AWD has been also claimed by some, but set reference number among the other sets released for the same half, uses to indicate the comparative box size within the portfolio and this, the diversity of functions introduced and price target set. Don't think we are going to see a three diff setup, into a 50,00€ set price though. Looks quite good even with the LBG toggle joints. But functionally? Not so good. Steering and engine are basic functions on a fair few sets, and suspension isn't exactly unique. 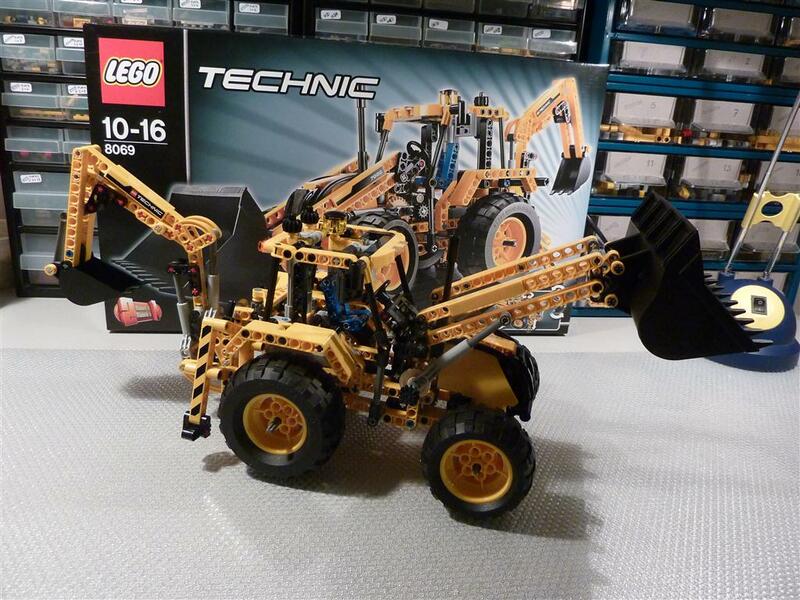 For the price, and the probable target of people new to Technic, it won't be too bad, but I suspect not so much for the rest of us. I also forgot to mention, off-topic though it is, the Bucket Truck and Flatbed Truck can be pre-ordered on Amazon UK. Flatbed is £71.99 for 1115 pieces with a motor. That is actually a very good price! IMO this model looks like a designer was given a weekend task of making a sub par model using many parts that they were trying to get rid of. Not impressed at all. This set will be good for parts, that is about it. I respect all those who like this model, but I´m sorry, I just can´t see what´s "extreme" about it. I finally got my 8043 Motorized Excavator today! Price: 1.299:- SEK/approx. 145 Euro. Hasn't anyone noticed new rims? Same as before, mounted with inner-side outwards. so those with 6 holes around axle instead of 3 were used before? These were reported for having been used in the latest deliveries of the 8069 Backhoe Loader. Quite understandable as the change is also not yet reflected on BrickLink database. I became aware about this just by chance. Personally, it seams to be a real engine is under the hood. The box show a glimp of a yellow piston. And the second picture shows the characteristics of the cylinder, if you look between the double bent liftarm 1 x 11,5 and the new panel 17. This ruins the whole model in my opinion. They make a new large black panel for this and then resort to old style pieces that don't color match? bah. this looks like it can be made on your own if you have the right parts,i ordered the supercar yesterday and it looks very simalar in peices.looks ok i guess ,i would rather get the unimog and flatbed. Someone published images at Brickshelf, from the the Extreme Cruiser built. Also from the box backside, revealing the model, which I don't even know what to call it. The B looks like a hot-rod in the same style as the 8070 B-model. This... this is probably one of the most disappointing 2H sets of the last few years IMHO. Actually I wouldn't call it 2H anymore. The fact that it is reported online, as "In Stock" and someone already posting pictures from a real box/set, points towards one release like it was the case of 8041 (Race Truck) in 2010. Specific for some retailers, and targeted the late 1H. But, looking at the bright side: it is still considerably better than the last two Exclusives, the 8041 Race Truck and the 8063 Tractor with Trailer. Plus, if one of the year's sets really has to be an exclusive and therefore see less availability, then let it be this one. I am quite disappointed by this model. Even the suspensions seem to be built with just one shock absorber in the front and one in the back. I usually just go for the biggest sets because I believe they can offer a better value for money. Regarding the aesthetics the best and most original part is probably the front. For the rest it looks quite similar to the 8297 in a smaller scale but with much poorer functions. I can't quite tell from the brickshelf pictures, but is that a V4 engine under the front? Honestly, these "Limited Edition" models sometimes look a bit of a joke. It looks like the "Limited Edition" brand is out there to push and sell more a model that otherwise would have little chances .. The building instructions for this model are now available for download at http://technic.lego.com/en-us/BuildingInstructions/default.aspx. Looking at them, it appears that there is indeed a V4 engine, as well as front and rear suspension, the former using a single horizontally mounted spring. The alt model, a sporty-looking hot rod, has all the basic features of the main model, including suspension all round and V4 engine. Fantastic-looking model!